We kicked off the 2017 Race season with our Team Captain Training on Saturday, February 4. Our goal with this meeting was to make sure our fabulous team captains have all the tools needed to successfully lead their teams, make the biggest impact in the fight against breast cancer, and have a great Race day experience. We will have another opportunity to connect with other team captains and get helpful tips & tricks at the Team Captain Roundtable, happening Saturday, March 11. RSVP here to join us that morning! Debbie Broerse kicked things off with a warm welcome to the crowd of attendees. When she asked how many survivors were in the room, many hands went up! We had a few ‘newbie’ team captains in attendance too. We introduced the Komen Central Indiana team, including our Race Director Kari Strolberg. Our mission is to save lives by meeting the most critical needs in our communities and investing in breakthrough research to prevent and cure breast cancer. 40,000 people in the U.S. are dying each year from breast cancer. By 2026, Komen has a bold goal to cut that number in half. Your support provides access to quality and timely care, including patient navigation, and funds research to find the cures for the most aggressive types of breast cancer. Being More Than Pink is about celebrating and honoring everyday heroes who like you, work so hard to make a difference in this cause. Team captains are the leaders of this movement in our community! Every team captain for the Susan G. Komen Central Indiana Race for the Cure™ is More Than Pink. THANK YOU! Check out this example of an everyday hero, Allison, to see why fundraising for Race is so important to her. Race registration is open now! Click here to sign up and start making an impact. Click the pink “Register” button in the top right corner. If you’ve participated in Race before, it will ask you to enter your username and password. If you do not know your username and password, please contact the Komen office for help retrieving this information. If you have not participated before, follow the prompts to register as a new participant. Once you are registered for the 2017 Race, you will get an introduction email from your team liaison, a resource for you to make sure you have an engaging and successful Race experience this year. For any questions about navigating or using the Race website, please contact us! You can edit both your personal AND team pages by clicking ‘Edit Page.’ The steps for updating each page is very similar, but you are welcome to include different information in each place. For example, your personal fundraising page can include details about why you Race and why being a team captain is important to you. Your team fundraising page can talk about your team as a whole. Both pages include the option to upload a cover photo (similar to how you would do this in Facebook). Tip: Make sure your cover photo is sized to 970 pixels x 370 pixels. 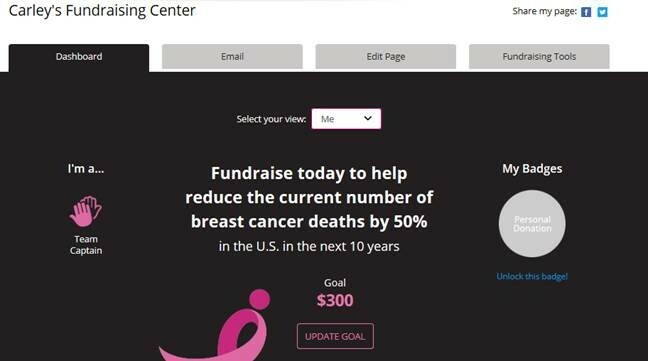 If you need help customizing your fundraising pages, please let us know. We are happy to help! Team awards are BACK this year! Some will be awarded on Race day and others will be announced after the fundraising deadline. We are renaming Survivor Village to Hope Village and refreshing the participant experience inside that area this year! On Saturday, April 22 we will be at Castleton Square Mall in front of Macy’s to promote Race registrations. Stay tuned for more info on this and more packet pick up details for the week of Race! Team Captain Packet Pick-Up – Stay tuned for more details! 2017 Race Ambassador Kelly Frakes shared her breast cancer story with the group, and the Race team drew names for some great prizes, including Komen gift baskets, VIP parking for Race and calling the start of the Race. Congratulations to all the winners!